I’m making the desserts for a baby shower this weekend. Today I made the candy, molded chocolate to decorate the cupcakes and cream cheese mints. Cream cheese mints are a great, inexpensive way to add a little flair to a party, reception, or shower. The only downside it that they do take time to make. They also need to be made in advance, at least 24-48 hours before the event. Combine everything in a large bowl except for the granulated sugar. Mix it together by hand until well blended & smooth. It takes several minutes, but stay with it. Break off pieces the size needed for the mold. Roll into a ball, roll it in the granulated sugar, & press into mold. Pop the candy out of the mold onto waxed paper to dry. Allow to dry 12-24 hours before storing in Tupperware container. If made more than 48 hours in advance, store in refrigerator. 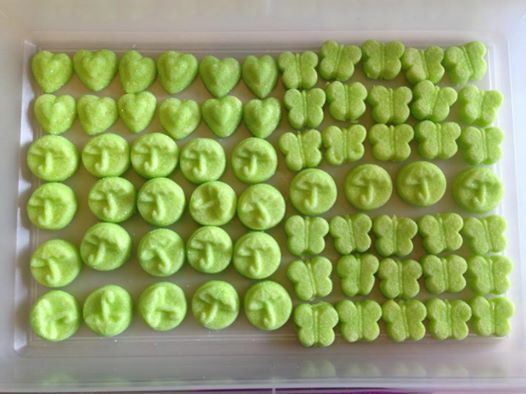 Depending on the size of the molds used, this recipe will make around 100 mints. To serve, place mints a nice plate or tiered server. For these mints, I used 1/4 tsp Wilton creme de menthe candy oil, 2 small squirts electric green coloring gel, and pale green granulated sugar. I also used 3 different shaped molds. The round with umbrella used 1 tsp of the candy. The butterfly used 1/2 tsp of candy. The heart used a scant 1/2 tsp of candy.